Life sciences research can be demanding, and if you are involved in neuroscience, cancer research or other cell- or organism-based disciplines, you’ll often need microscopy data for your work. Emerging technologies such as CRISPR / Cas open up innovative ways of thinking and allow you to ask altogether new scientific questions, deeply affecting your imaging experiments. To monitor life as undisturbed as possible requires low labeling density for your biological models—for example, 3D cell culture, spheroids, organoids or even whole organisms—and this calls for 3D imaging that combines optical sectioning with low phototoxicity and high speed. 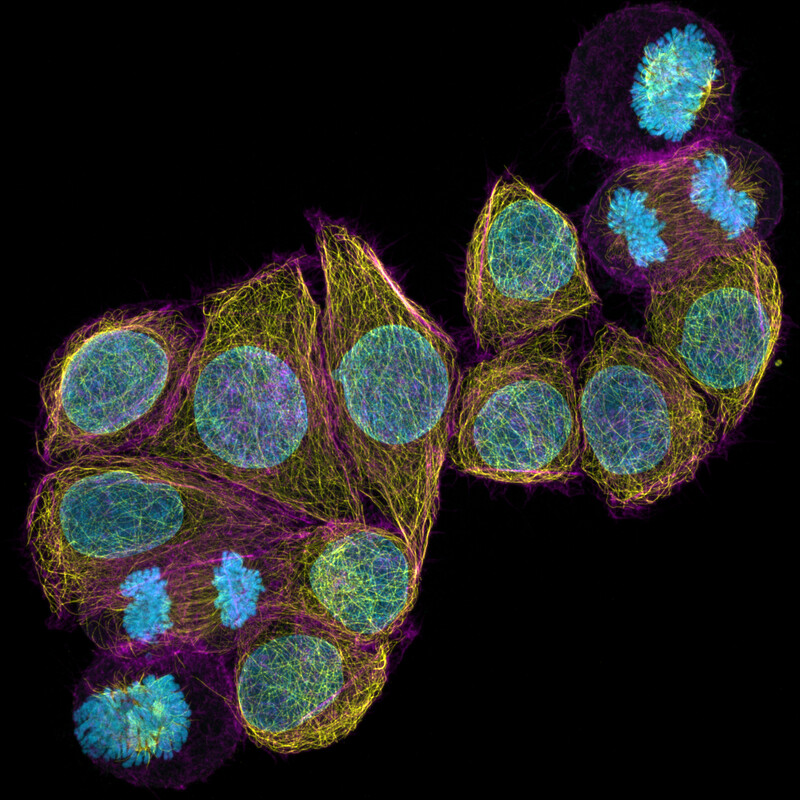 HeLa cells stained for DNA (blue, Hoechst 44432), microtubules (yellow, anti-tubulin Alexa 488) and F-actin (magenta, phalloidin Abberior STAR Red). Imaged with ZEISS Airyscan 2 in Multiplex mode for efficient superresolution imaging of a large field of view. Courtesy of A. Politi, J. Jakobi and P. Lenart, MPI for Biophysical Chemistry, Göttingen, Germany. The new Multiplex mode for ZEISS Airyscan 2 delivers more information in less time. Smart illumination and detection schemes allow parallel pixel acquisition for fast and gentle confocal microscopy. Researchers can now image their most challenging three-dimensional samples with high framerates in superresolution. The speed and sensitivity gain can be used to gently capture either fixed samples in larger fields of view with higher throughput and without bleaching, or dynamic processes in living specimens with minimal disturbance. 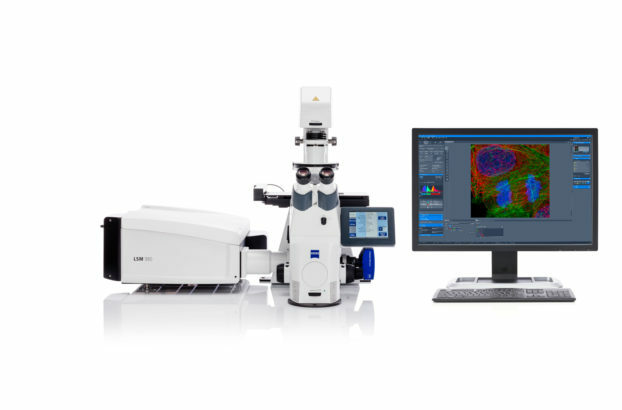 The Multiplex mode is available for the whole ZEISS LSM 9 family: ZEISS LSM 980 is the flexible research platform with complementary multiphoton and superresolution capabilities. ZEISS LSM 900 is a very compact system that delivers image quality without complexity. ZEISS LSM 980 with Airyscan 2 is the ideal platform for confocal 4D imaging that combines optical sectioning with low phototoxicity and high speed. The new ZEISS LSM 980 with Airyscan 2 is the ideal research platform for confocal 4D imaging. The entire beam path is optimized for simultaneous spectral detection of multiple weak labels with the highest light efficiency. Researchers benefit from the full flexibility of a point scanning confocal and the speed and gentleness of the sensitive ZEISS Airyscan 2 detector. The new Multiplex mode combines an elongated excitation laser spot and parallel pixel readout of this area detector. This allows acquiring up to eight image lines in a single sweep. Users can gently image larger fields of view with superresolution in shorter acquisition times than ever before. ZEISS LSM 900 with Airyscan 2 is a very compact confocal microscope for high-end imaging. This system has a genuinely small footprint, concentrating on the essence of a confocal and leaving out needless complexity. It fits easily into labs or imaging facilities and is optimized for ease of use. ZEISS LSM 900 can be combined with ZEISS Celldiscoverer 7 for automated confocal imaging with high efficiency.